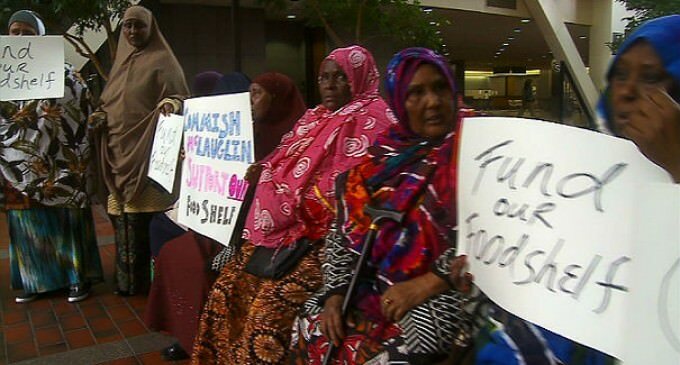 A group of Somali women who all receive food stamps are demanding that food be provided that meets Islamic requirements, something that their county of Hennepin has so far refused to do. Minnesota has the largest Somali population in North America and because they are refugees they receive a lifetime of welfare…free medical, education, housing, food utilities, money, etc etc. As if it’s not bad enough that nearly all the “American” Muslims who have joined ISIS have been Somalis from Minneapolis, their relatives here are demanding that Americans adhere to the same Sharia Laws the Islamic State fighters are trying to impose throughout the Middle East. A group of first-generation Somali Americans says they need help in developing a food shelf that specializes in healthy foods that do not contain pork or pork byproducts. “It’s about human rights also, basic human rights to get the proper food and also healthy food,” said Imam Hassan Mohamud. “Human rights”? Seriously? Their arrogance and self-entitlement has to be unprecedented for a group on the public dole. Tens of thousands of Somalis settled in Minneapolis/St. Paul after Bill Clinton, George W. Bush and later Barack Obama imported them and funded massive “refugee” centers there. Welfare, schools, hospitals and social services have been crushed by the burden of immigrants who lack the most basic skills to live in a modern society. This is hardly the first demands Somalis have made on the good people of Minneapolis. When the influx of Somali thugs natually resulted is a massive increase in crime a decade ago, Somalis demanded a $48 million Sharia-compliant “youth center” to keep Somali gangs “out of trouble”. We have read for several years now how Muslim cab drivers in Minneapolis and several airports have kicked out blind passengers with guide dogs (dogs are “unclean” in Islam), or customers transporting alcohol. They came here, taking advantage of American generosity, and returned it by enforcing their own brand of Sharia Law upon us. Liberals in Minnesota have bent over backwards for them, setting up foot-washing basins in their airport and even at a university, in response to their demands. But as with most appeasement, these refugees keep making more demands. Now it is for “halal” products (meat slaughtered with Islamic prayers and a ban on pork). As someone who made use of the foodshelf recently, I can tell you that most of the food doesn’t contain pork. I hear what they are saying about a literacy issue, but can’t the food shelf people just point out the cans of pork and beans? Besides, the food shelf is based on donations! This is not about Muslims “making do” or getting help on what to eat. The Koran demands that Muslim make any country they live in adapt to them and Sharia Law. The last thing they plan to do is assimilate. Let the genetic debris starve! Crazy. They need to go back where they came from. They can get all the food they need.